The Blue Angels is the United States Navy's flight demonstration team whose mission is to enhance Navy and Marine Corps recruiting efforts and to represent the naval service to the United States, its elected leadership and foreign nations. The Blue Angels serve as positive role models and goodwill ambassadors for the U. S. Navy and Marine Corps. At the end of World War II, Chester W. Nimitz, then the Chief of Naval Operations, ordered the formation of a flight demonstration team to keep the public interested in naval aviation. The Blue Angels performed their first flight demonstration - in fact, the world's first such demonstration - less than a year later in June 1946 at their home base, Naval Air Station (NAS) Jacksonville, Florida. Flying the Grumman F6F Hellcat, they were led by Lt. Cmdr. Roy “Butch” Voris. By the end of the 1940’s the Blue Angels were flying their first jet aircraft, the Grumman F9F-2 Panther. In response to the demands placed on naval aviation in the Korean Conflict, the team reported to the aircraft carrier USS Princeton as the nucleus of Fighter Squadron 191 (VF-191), "Satan’s Kittens", in 1950. The team reorganized the next year and reported to NAS Corpus Christi, Texas, where they began flying the newer and faster version of the Panther, the F9F-5. 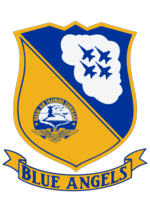 The Blue Angels remained in Corpus Christi until the winter of 1954 when they relocated to their present home base at NAS Pensacola, Florida. It was here that they progressed to the swept-wing Grumman F9F-8 Cougar. In December 1974, the Navy Flight Demonstration Team began flying the McDonnell Douglas A-4F Skyhawk II and was reorganized as the Navy Flight Demonstration Squadron. This reorganization permitted the establishment of a commanding officer vice a flight leader (Cmdr. Tony Less was the squadron’s first official commanding officer), added support officers and further redefined the squadron’s mission, emphasizing the support of recruiting efforts. On November 8, 1986, the Blue Angels completed their 40th anniversary year during ceremonies unveiling their present aircraft, the new sleek F/A-18 Hornet, the first dual-role fighter/attack aircraft now serving on the nation’s front lines of defense. In 1992 more than one million people viewed Blue Angel’s performances during a 30-day European deployment to Sweden, Finland, Russia, Romania, Bulgaria, Italy, the United Kingdom and Spain. This was the first European deployment in 19 years. The 2006 show season brought out more than 15 million spectators. Since 1946, the Blue Angels have performed for more than 427 million fans. An all-Marine Corps crew of three officers and five enlisted personnel operate the Lockheed-Martin C-130T Hercules, affectionately known as Fat Albert Airlines. Fat Albert joined the team in 1970 and flies more than 140,000 miles each season. It carries more than 40 maintenance and support personnel, their gear and enough spare parts and communication equipment to complete a successful air show. Fat Albert cruises at a speed of more than 320 knots (approximately 360 miles per hour) at 27,000 feet. Four Allison turboprop engines, which produce more than 16,000 shaft-horsepower, provide Fat Albert Airlines with the power to land and depart on runways as short as 2,500 feet. At select show sites, Fat Albert demonstrates its jet-assisted takeoff (JATO) capability. Eight solid-fuel rocket bottles, four on each side, attached near the rear paratrooper doors thrust the Hercules skyward. Fired simultaneously, the JATO bottles allow the mammoth transport aircraft to takeoff within 1,500 feet, climb at a 45-degree angle, and propel it to an altitude of 1,000 feet in approximately 15 seconds. Getting Fat Albert airborne in minimal time and distance simulates conditions in hostile environments or on short, unprepared runways. This page was last modified on 26 June 2016, at 22:55.